Feeding Our Lives, LLC: Reduce, Reuse, Recycle. Last week on trash day, I noticed that my neighbor had a completely full large trash bag sitting on the sidewalk waiting for the trash man to take it to the landfill. Then I looked at my kitchen trash bag almost full. I was quite proud of my family for trying so hard to not throw much away! You see, my neighbor lives alone. No kids. No pets. No renters. Just him. He filled up a regular trash bag by himself. That week I had four people in my house and only almost filled a kitchen trash bag. You could be concerned for me since I found myself competing against my innocent neighbor OR you could be proud of me for Reducing, Reusing, and Recycling! One way that I reuse is re-purposing glass jars. After we finish using a glass jar of salsa, mayonnaise, etc, I wash it, sometimes get the label off, and then store it in my cabinet. If my cabinet's full, the jar goes in the recycle bin. If there's room, I add the jar to my collection. 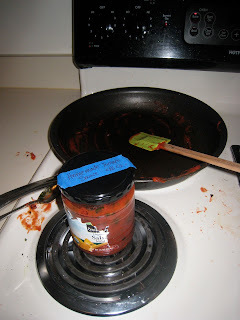 When I make homemade freezer jam, homemade stock, homemade tomato sauce (above), etc, I take out a jar, put some painter's tape on top, label it, and throw it in the freezer. It costs me nothing! It keeps it out of the landfill! It's safer than plastic for my food! How do you Reduce, Reuse, Recycle? ?